When looking for a new standing desk, most people will see one brand come up very often: Varidesk. Varidesk products have long been leaders in the industry and continue to create fantastic standing desk converters that allow anyone to transform their current desk into a sit to stand desk in no time. As an amazing quick fix solution, it’s no wonder the Varidesk products have been so popular and continue to get amazing reviews all over the internet. This, however, doesn’t mean they are 100% fool-proof, and there are in fact some issues that we would like to address in the following article. Today’s product we will be reviewing is the Varidesk Pro Plus 36, which is currently a number one best seller on Amazon. The Varidesk Pro Plus 36 all-in-all is a well-built, functional, easy to set up, and sturdy piece of equipment. It is a ready out of the box, one size fits all solution. Its great for anyone looking to get started with a standing desk quickly and without hassle setting up, and it is also big enough to hold two monitors for those people who need that extra workspace. The issues with the product are few and far between, but we will look at each one individually and what solutions you have to fix it. Unlike many other standing desk converters, the Varidesk comes preassembled. In fact, the Varidesk was one of the first to do this, and it was one of the things that people who use the Varidesk love the most. Many people these days have a busy schedule and are not looking for another IKEA-type product with huge instruction manuals and many different ways to go wrong. If you’re the type of person who doesn’t have the time or patience to put your own standing desk together, then we definitely recommend the Varidesk. When the box arrives, you literally just have to unwrap it and stick it on top of your current desk and that’s it, a brand new sit to stand desk! An important feature for any sit to stand desk, especially if you are not going to be the only one using it. This product is a height adjustable desk converter, and in fact, has 11 different height settings to choose from. It can be easily used as a normal seated desk, or even if you are using an elevated seat you can bring up the Varidesk just a few levels. For the people out there wanting to stand all day, bring it up to eye-level at its highest level setting. The adjustments are also a breeze and don’t require you to exert yourself, as a spring-loaded z-frame will bear most of the weight as you bring it into position, moving the desk from a seated to s standing position in under three seconds. When it comes to standing desks, there are many shapes and sizes available. Some people will only ever need a small desk that can hold their laptop, however nowadays more and more people are inclined two use at least two monitors. The Varidesk Pro Plus 36 boasts enough working space on the upper deck of the unit to hold two 24 inch monitors. In fact, if you’re willing to adapt a little and rotate the screens slightly inwards, some users have reported to comfortably have two 27 inch monitors set up on their Varidesk. Due to its two-tier design, this space is also not going to affect your keyboard or mouse set up, as these have their own separate tier on which to sit. This working surface can also hold up to 35 lbs very comfortably, so feel free to stack it up with textbooks, monitors, laptops, and files, and don’t worry about it not coping. Most people think that a standing desk converter will be an eye-sore, and even worse that they won’t be able to sit properly at the desk with the new product on top. While this is true for some products, that they actually raise the height or the desk which makes it less ergonomic while sitting, the Varidesk Pro Plus 36 is an exception. Sitting only half an inch above your regular desk, the lower tier of the Varidesk will still be at an ergonomic height for typing and won’t put any extra stress on your wrists. The upper tier sits an additional 3 inches above the lower one and will keep your monitors elevated to the correct eye-level. Not only does it perform ergonomically, it also maintains an elegant design that won’t look out of place or intrusive in your office space. The unit itself is built almost entirely out of metal and has been praised for its solid, quality design and build quality. This can be seen in its weight, it is a large unit, weighing in at 52 lbs! Now, although this may scare some away, the Varidesk’s weight helps with the balance and stability of the desk, ensuring that whatever you have on top of your desk will be more secure. Also, it comes with a variety of different desktops, with different wooden ones or simple black or white colored ones. We mentioned the main points of the Varidesk’s functionality, but it is really worth giving ease of use an extra mention. After buying and receiving your Varidesk, you will be set up in minutes! No need to waste any time or miss any important work, because the preassembled product takes all the hard work out of the equation. Additionally, and more importantly, is the ease of use once it is set up. The Varidesk Pro Plus 36 is a manual converter, meaning there is no automated height adjuster. Although people may think it would be difficult to remove all your computers to readjust the desk, this couldn’t be further from the truth. The desk can hold up to 35 lbs of weight and be moved from sit to stand in under three seconds, without removing anything, and in a smooth fashion so nothing will slip, slide, or break. Have look at this video by the maker’s of the Varidesk Pro Plus 36 to give yourself a good idea of the table’s style and capabilities. As mentioned before, the Varidesk standing desk converter is not without its faults. Among these faults there aren’t many which are true issues with the quality of the product, however, they are definitely worth considering before purchase. One of the main complaints of the Varidesk is that, although it is height-adjustable, this is limited to a certain height. Since it is a standing desk converter, it will sit on top of your regular desk, therefore the final height is variable depending on the desk below. That being said, as a general review from users, if you are over 6’1″ (185cm), you will start having problems. This isn’t a major issue for most people and anyone under 6′ (183cm) tall will be more than comfortable using the Varidesk, however, we definitely recommend being careful if you are taller as you’ll have to crouch or tilt your head down, which is not an ergonomic position for your spine. Solution: for taller people Varidesk has a larger version of this product called the Exec 40. It was specifically created for people over 6’1″ (185cm). Otherwise you can also look at another slightly cheaper option, which elevates higher than the Pro Plus 36, but not as high as the Exec 40. Those among you who really need the extra height, take a look at what we believe are the 6 best standing desks for a tall person. The fixed keyboard is in general not the best in our opinion. If you look at our Standing Desk Buyer’s Guide, we say that for a truly ergonomic office desk, being able to control the keyboard tray and monitor height separately is preferable. With the Varidesk, the keyboard will always be a fixed height below the monitor. Solution: the main solution here is being able to adjust the monitor height. If you have a monitor with a telescopic frame, or maybe a separately mounted arm, then this will cause you no issue. If you’re not in this previous group, then, unfortunately, you will not be able to adjust the two parts separately. Don’t worry too much about this though, in fact almost no users of the Varidesk identify this as an issue, we just wanted you to be aware that if you needed this functionality then the Varidesk came up a little short. Despite being a contested issue, some seem to report it while others not at all, the stability of the Varidesk is worth mentioning. There are reports that at maximum extended desk height that the desk has a shake which causes the monitors to vibrate. This can be pretty distracting while you work and definitely not ideal for a productive workstation. Other people do claim however that due to the weight, it actually is more stable than your average standing desk converter. 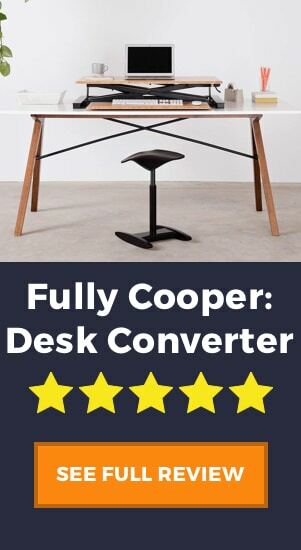 Solution: if stability is paramount and the small vibrations will be too distracting, then we believe that you should consider a full standing desk rather than a converter. The reason is, due to the build of a converter with legs that extend, it is more likely to be unstable when at full height. Another consideration is a standing desk converter like the ReadyDesk, which will be more difficult to adjust than the Varidesk, but more stable once in position. Weighing in at 52 lbs, the Varidesk is a big piece of equipment. Definitely, this needs to be considered when buying for a couple of reasons. Firstly, its portability: are you buying a converter specifically because you want to be moving it from place to place and using it in many locations? Then be aware that transportation will not be as easy with a converter this heavy. Secondly, you should consider the strength of your current table and if it will be able to hold the Varidesk, plus your current workstation, this could weigh almost 90 lbs! For example, if you use a glass-top table then maybe you need to look for a sturdier base table to support your new standing desk converter. Solution: the Varidesk is actually not heavier than its competitors, with many standing desk converters weighing between 50 and 60 lbs. This weight as we mentioned helps with stability and balance when you work, but if portability is a necessity for you, then take a look at the lighter VersaDesk which is only 37 lbs. This con is actually not unique at all to just the Varidesk Pro Plus 36, but in general, with most z-frame standing desk converters, you will encounter a similar issue. Due to the dynamics of the lifting mechanism, the Varidesk doesn’t lift directly upwards and will lift up and away from your desk, pushing you back 6 to 10 inches from your desk. This won’t be a problem for people with larger offices, but if you work in a cubicle or tight space, then you might run into trouble. Solution: if you read our Standing Desk Buyer’s Guide we discuss the size of a standing desk in your purchase decision. There are many options available for tighter spaces, or even other standing desks that rise vertically and will not cause you the above concern. It’s clear to see why many people use and recommend the Varidesk Pro Plus 36. 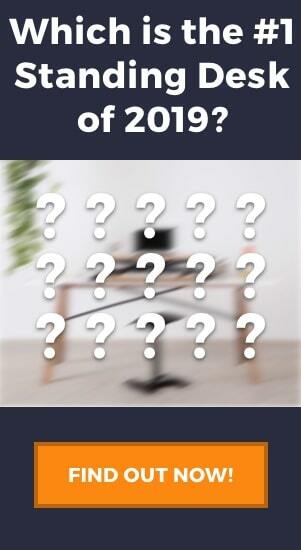 Be aware that every desk comes with some pitfalls and the Varidesk is no exception. If you are a taller than average person, work in a confined area, or require move adjustability from your standing desk, then we recommend looking at another product, a few examples which we gave above. However, if you’re not, then the Varidesk is a fantastic product for you. With its large separated trays for a dual monitor set up, its eleven height settings for people of (almost) all sizes, spring-loaded lifting mechanism for a simple sitting to standing transition, and its fantastic out-of-the-box functionality, the Varidesk Pro Plus 36 will transform your current working space into the ultimate sit to stand working area. Don’t forget to think about other products that can compliment the Varidesk, such as a monitor arm and a standing desk mat, to make your workstation even more ergonomic and comfortable.